Gratitude Friday: Finally! A Phone! If you ever told US me that I’d be able to live four months without a cell phone, I wouldn’t have believed it. But, yes, I made it 4 months. Many of you know the story, but for those catching up, you have to be a Swiss resident to get a phone contract. My first two days I didn’t carry it around as I was afraid I’d hurt it. But, now it goes with me where I go. -Hands down, its the TPG app that is my favorite thing about iPhone ownership. I can check the bus and tram schedule continually. I love love love this feature. I don’t care if I don’t get another app…this one fulfills me! -It’s nice to be able to have a communication device when meeting up with friends so if they miss the bus, or something changes. Otherwise, we had to do it old school. Show up at the planned time and if they don’t show, try to guess what happened to them and try to react like you’d think they would. -It’s nice to have a phone # to give people, like repairmen, delivery people, etc. -You can now call me! So, let me know if you want my digits…..
-I have felt really free not being tied to a communication device. Working in Corporate America, I had my blackberry at the hip and I feel like it developed a little bit of ADD as a result….checking messages, multi-tasking, and being in constant contact. -I missed my stop on the tram because I was taking this photo of the really large cello riding along playing music for the passengers. Whoops! 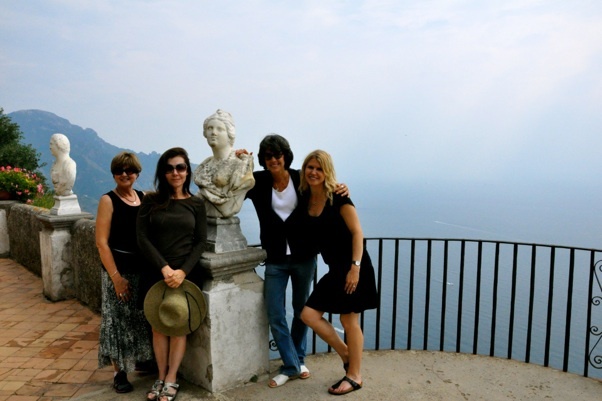 I spent a week in Positano a few years ago and really enjoyed my time on the Amalfi Coast. This time was no different but very special to spend it with family and friends. 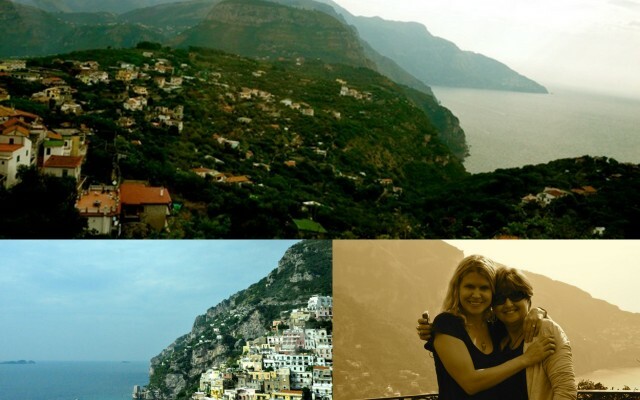 Very much fun to hear the oohs and aahs cascading down those winding roads and cliffs along the seashore from Sorrento to Positano. 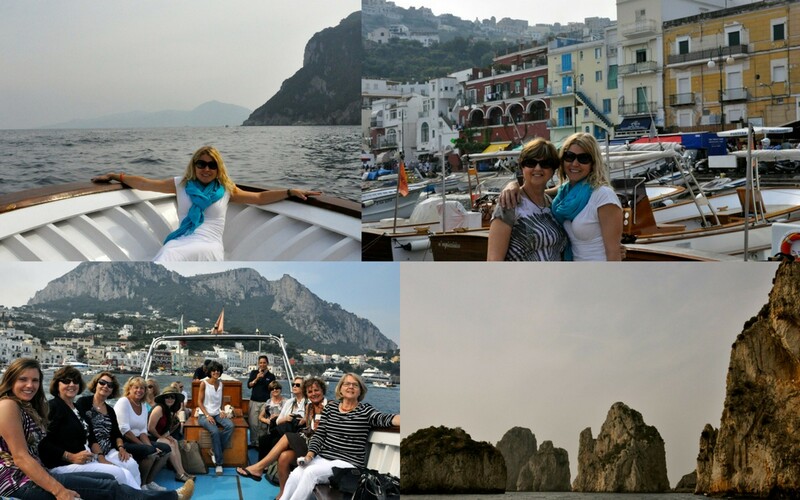 We also took a boat to Capri. While the blue grotto was closed this trip due to rocky waters, we were able to get quite close to the emerald, white, and coral grottos. Just a bit lower than Tuscany, Umbria also has a remarkable landscape. It’s slightly drier and more rustic than its Northern neighbor, but still quite capable of amazing things. 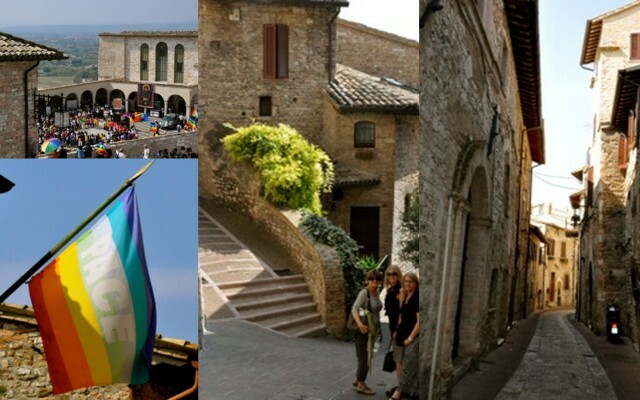 One of the towns we visited was Assisi which is the famous birthplace of St. Francis. I adored the town and its classic and simple pink stone. The pink is a naturally sourced stone from Umbria and used to decorate the basilicas simply without too much adornment, as was restricted in St. Francis’s day. The reason for the simplicity is that St. Francis believed in peace and the renouncement of material things. The basilica contains simple frescos instead of ornate stones and gold. In fact, Kay had encouraged us all to say a prayer and to do one act as St. Francis would do in this experience, rather than be a typical tourist. She encouraged us to slip some coins to the poor and forgoing the traditional souvenir. It was a beautiful mindset in which to enter this holy place. Adding to this experience, we witnessed a peace rally marching 20km from Perugia to the basilica. This peace celebration only happens every 3 years and it was a coincidence that we were able to be a part of it. 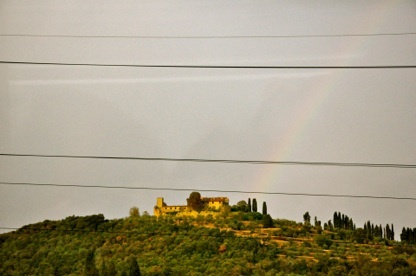 On our ride home that evening, we witnessed a little peace as well when we saw this rainbow on the Umbrian landscape. What a nice souvenir. Also in Assisi, we had the opportunity to visit a few Umbrian locals at Tivi Vini, a winery near Assisi. The same pride we’d seen from Elena at La Stoppa and Filipo of Fattoria della Cinta, also poured out in the mother daughter combo Tili and Maria. We tasted their Assisi biance (chardonnay and pinot), the Grechetto (95% grechetto, 5% pinot), Pinto Nero (90% noir and 10% sangrantino — Rosie’s favorite), a Young (blend of 3 reds — Gabe’s favorite, a Rosso (Lauren’s favorite) and a 100% Sagrantino aged for 8 years. 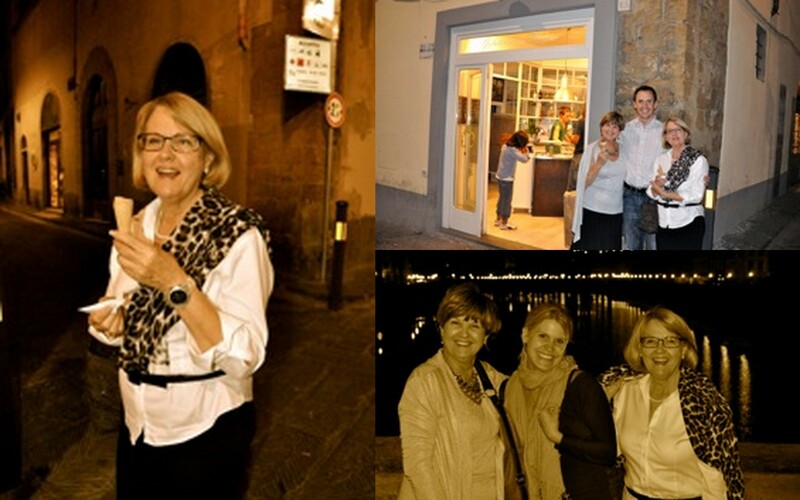 We returned to Florence that night, but the next day, we had the pleasure of dining in Orvieto. 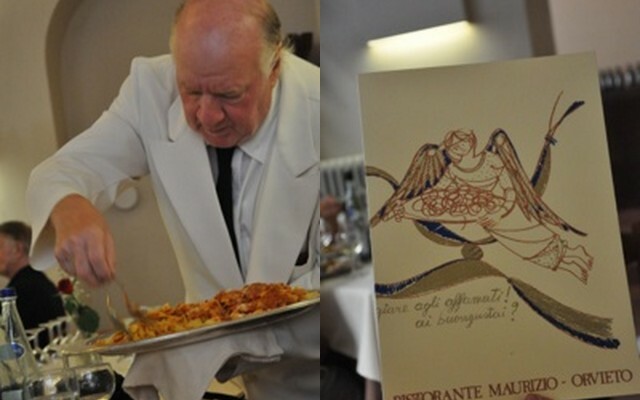 The meal at Restaurant Maurizo, just off the main square, was hands-down my favorite meal of the trip. We started with a great antipasti, then a truffle and cheek umberchelini, then pasta with lamb ragu, a secondi of pork with herb rub and roasted potatoes and then a selection of local cakes for dolce. I am a sucker for any type of mushroom but the truffles put me over the edge. What a meal! Umbria might be my new favorite over Tuscany. My first time to Tuscany, I remember feeling like I was driving through a Van Gogh painting. I loved witnessing with my own eyes the way the cypress dotted the landscape and gave protection to the rolling hills of vineyards and olive trees. 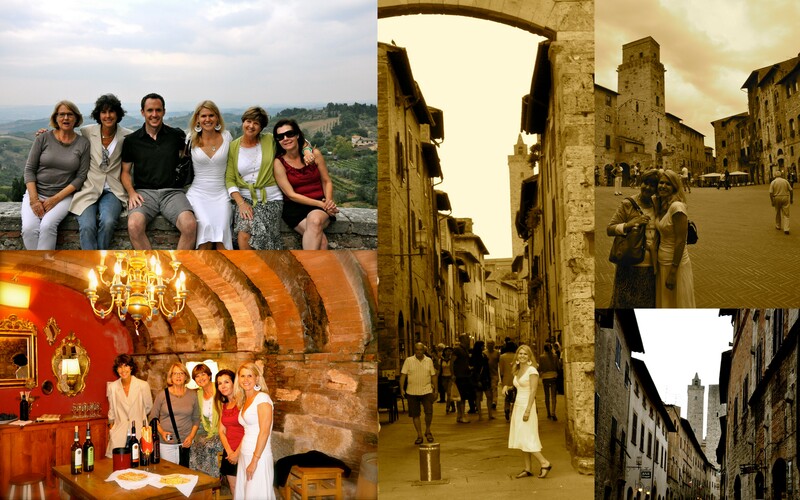 This trip, I was lucky that I got to see four new places in the Tuscan region. 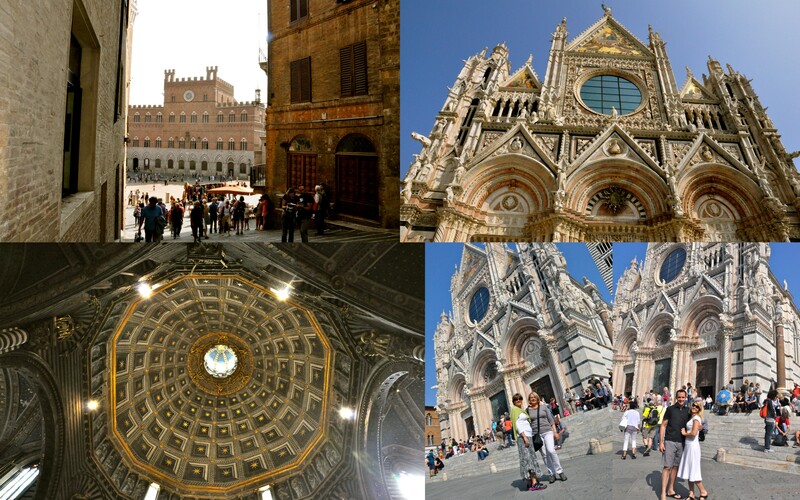 SIENA – Beautiful hill town, a continual rival of its neighbor Florence. Verdict: I prefer Florence. Although, maybe I should visit Siena again when we aren’t so pressed for time and I’m not hungry. 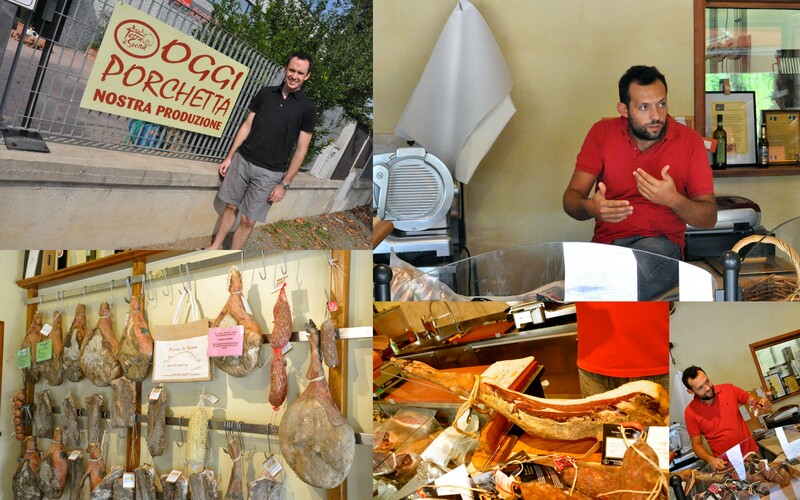 Since this trip was a terroir trip to experience food and wine, one of our stops was a tasting with a local Tuscan butcher, Filipo. He explained the history of the family business which was quite interesting, and then invited us to see the cinta pigs roaming on the land. Cintas are a different type of pig – they are striped – and they also graze on nuts, forest foliage, and berries. On the trip over, we discussed how important we think it is to see the source of our food. Too often you forget. Filipo shaved our fresh prosciutto off the leg. This is a big reminder to me how we should respect our food and not waste. Also, the way that his free range cinta are treated is a lesson for how important these practices in when selecting what products we purchase. I found it ironic I wore a white dress on the pig farm visit day. San Donato is a tiny medieval town in the Tuscan hills. We had a wine tasting at Fattoria San Donato of local wine – vernaccia (white) and chianti (red) as well as their beautiful olive oils. 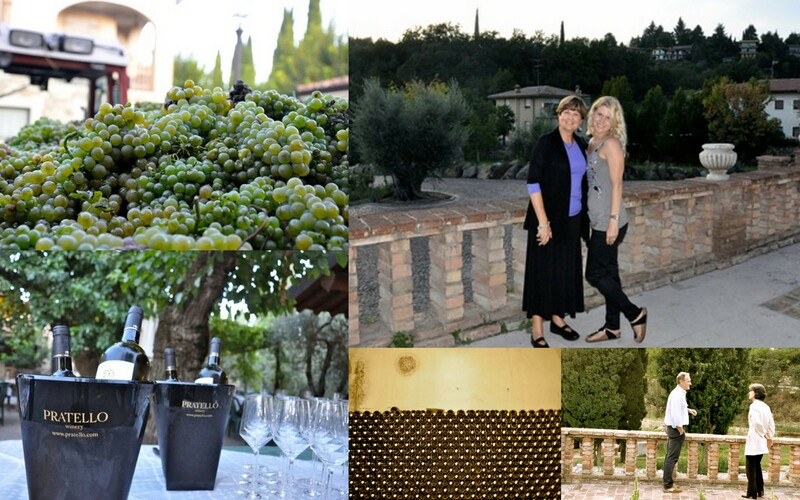 A highlight was walking through the familial home to find our courtyard tasting in the groves. San Gimingnano is another charming Tuscan hill town, instantly recognizable by its peaking bell towers. We tasted more tuscan wine and olive oil at La Marronaia, another friend of Kay’s who had a sumptuous cellar. We tasted basic vernaccia, visila, chianti colli sennesi, intenso and quattrossi. I brought back some olive oil to accentuate my Italian dishes. Firenze is Florence in Italian. My first trip to Italy, my friend Randi and I stayed in Florence for the week for exploring Central Italy. 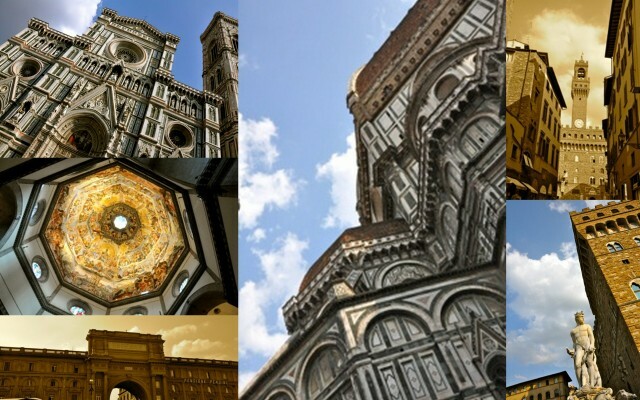 And, Florence was really my first love affair with Italy. And, this trip, it still felt as good to walk those worn city streets. I just adore the feeling of the streets. There really is no city that I have seen that maintains so much of its architecture. A few years ago, I read The Agony and The Ecstasy about Michelangelo’s life. I loved envisioning him as a young man in Florence walking these same streets we can today. Gabe arrived later that evening and we did a family dinner at to Trattoria 4 Leoni which is my favorite restaurant in Florence. It was recommended to me in 2007 by my dental hygienist, Katie, who lived 2 years in Europe. I have sent many people there since and its always been a highlight for them as much as it has been for me. Afterwards, although we’d already had dessert, we could resist a stop at a gelateria for a cone. The tastes of Italy are so irresistible! It made a good snack as we walked back to Ponte Vecchio and enjoyed a calm peaceful Firenze evening. Our second day, we took a trip down to the Emilia Romagna region of Italy which is famous for parmesan, grana podano, parma ham, balsamic vinegars, olive oil, copa and of course, wine. Our leader, Kay, is friends with the owner of La Stoppa, Elena Pantaleoni, and so we shared a beautiful autumn afternoon with her at her family vineyards near Rivergaro. Elena runs a completely organic operation, and we learned about the hard work required for this designation, but how very important it is for the preservation of the land. Gabe and I are both California wine lovers so it was interesting to hear the New World vs. Old World philosophies in wine. My biggest learning from both Elena and Alberto the evening before was how the Old World / European believes more in the terroir, and the wine is a result of the land, where New World believes the result is in the creativity of the winemaker, in the cellar. Next, we tasted their different varietals. 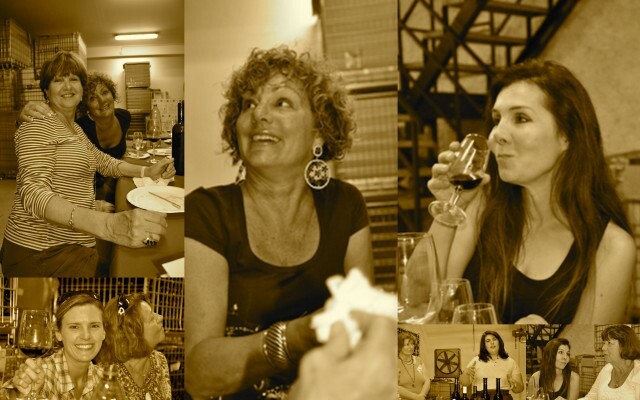 We started out with six on the table for tasting, but realizing how into their wines we were, they started making cellar trips to give us different vintages of our favorites and their new creations straight from the barrel. We tasted the wines alongside local meats like copa (the neck of the pig), salami and grana podano cheese. 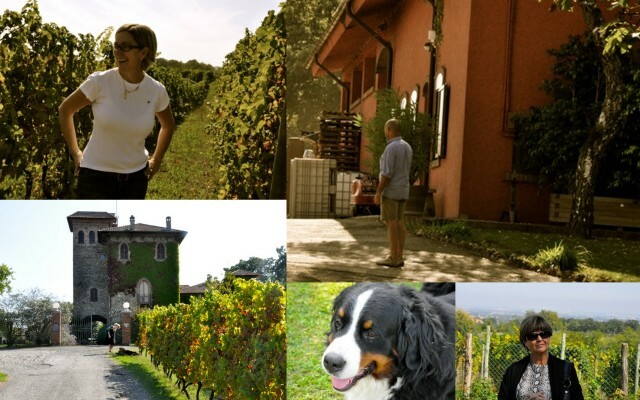 I enjoyed the flavors of the wine alongside the regional specialities of Emilia Romagna. The whites really were accentuated with the food. In the end, I bought a Barbera and a Macchiona 2005. Unfortunately, I was limited to 3 to take back so only the Barbera will make it back to Geneva in the end as the Macchiona was the group favorite so was opened for sharing in Firenze. It was a delight to spend this day with the wonderful people of La Stoppa. 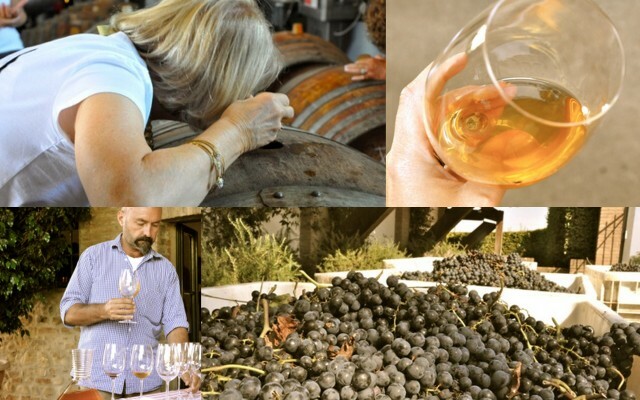 While I love learning about wine from all over the world, this special passion and pride is special to any other experience I have had in the States visiting vineyards. 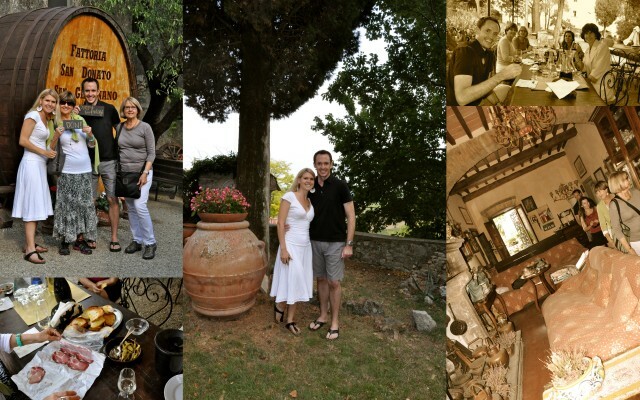 We felt like we were their family that day and are so grateful to Elena, Guilio and Francesca for their hospitality and inviting us into their estate. What an amazing place. Apologies in advance for a week of Italy on the blog. There was just to much to fit! The first stop on our trip was to Sirmione, Italy which is located on Lago di Garda in the Northern Italian region. Sirmione rests on a skinny little peninsula jetting out into the lake, providing panoramic views all around. A medieval castle rests on the tip and provides a reminder of the rich history in the Northern Italian lake region. The night prior, we had the pleasure of seeing a wine harvest in process at nearby Pratello winery in Padenghe del Garda. Alberto took us around the vineyard, showed us the biolake, and we also explored the cellar and grounds. He took a few jabs at California wine production indicating that “wine shouldn’t taste like wood” and then explained how they use steel tanks or neutral oak. He had a great pride of the Italian viniculture and it was contagious. 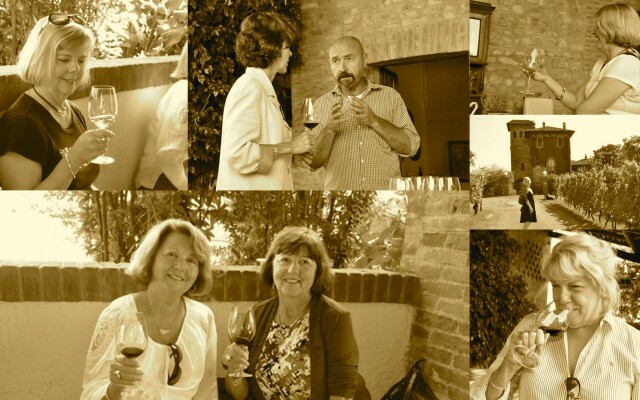 We had a delightful tasting evening of their sparkling wine-Metodo Classico, their whites-Catulliano & Lieti Conversair, and their reds – Poderi Ogaria and Rebo. Following, we had an incredible meal al fresco on the terrace. I purchased the Rebo and also brought home a bottle of sparkling for a future occasion.